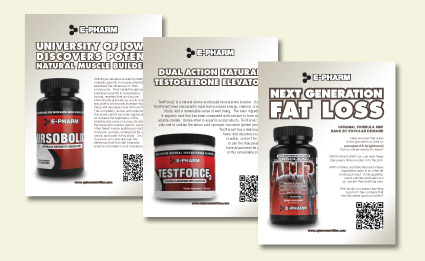 Project Description: E-Pharm Nutrition needed a sales flyer that quickly imparted information regarding their complex product line and helped funnel customers and distributors alike toward their website for more information. The challenge of the project was to balance the depth needed to describe the product line while still maintaining the readers attention. The solution was to create a series of sales flyers, one for each product, that gave a quick product overview so that a consumer would know what the product was supposed to do for those consumers interested in the “what it does” aspect of the product. Then a QR code was added to each flyer that launched a webpage that went in-depth on how the product actually worked for those folks that wanted to get into the complexities of the “how it works”. Wrapped in a design that strengthens the brand image as a whole and Six Demon Studio had created a printed piece that seamlessly fit into the rest of E-Pharm Nutrition’s marketing efforts.